When Art Asylum started making their "C3" sets, there was no question that the whole exercise was just a dodge. They'd found and exploited a loophole that allowed them to be the first company since Mego to make both Marvel and DC toys at the same time. But when Lego announced they'd soon be making Batman Lego sets, it seemed the door had been slammed on AA. Thankfully, though, DC Direct has come to the rescue. The reason that Art Asylum couldn't just make DC Minimates was that DCD was already selling "Pocket Superheroes," really unimpressive lumps of plastic. But perhaps recognizing how well the C3 sets were doing, even from a company that had never tried something like that before, DCD has now partnered with AA to create official DC Minimates. The first offering from the line isn't actually available for sale: he was given away for free at the DC booth during the summer conventions of 2006. The debut figure in the official DC Minimates line is John Stewart, one of the four(!) Green Lanterns from Earth. Originally created during the early '70s as sort of an "angry young black man," John was part of the growing social consciousness in comics. Unfortunately, the militant personality stagnated fairly quickly, and John was relegated to just being "that black GL," a position he held for decades, until Bruce Timm came along. When the creators of the Justice League cartoon were putting together their team, they tapped John Stewart to fill the Green Lantern slot, which pissed off the fanboys, who thought his inclusion was just because of his race. And honestly, yeah, the fact that he was black had something to do with it, but that wasn't the only reason. Guys like Hal Jordan and Kyle Rayner had been featured in the comics for so long that their personalities were fairy well established - John had been a blank slate for years, so the writers could do pretty much whatever they wanted without worrying about whether or not they were getting it "wrong." Minimate John is quite blatantly based on his animated appearance. If the costume was't enough to give it away, the design of his face just hammers it home - it's easy to capture the look of Timm's "Americanime" designs on a flat surface, since that's how they were originally created. 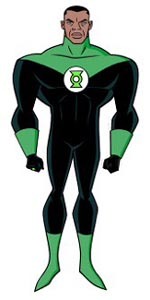 You can also tell that this is John from Justice League, not Justice League Unlimited - his model sheet changed between seasons, and this figure still has, as voice actor Phil LaMarr called it, "the very '80s haircut." What, the kids weren't still wearing the high-top fade in 2001? All the Minimates share the same basic body, and they all move at the same 14 points: neck, waist, shoulders, elbows, wrists, hips, knees and ankles. That's a heckuva lot of motion for something so tiny. The paint apps are what really separate one character from the next, and John's costume is captured well. All the lines are crisp, and they even put a little green dot on his right hand - his power ring. Ever since he started appearing on the Justice League cartoon, John Stewart's stock has been on the rise. He was quickly written into the JLA comic, and is a featured player in Green Lantern, as well. 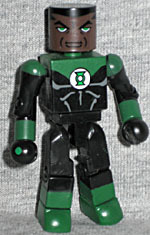 Like so many before him, this GL has gotten a big boost thanks to something from outside the world of comics, and is even serving as the Minimates' ambassador to this strange new universe.